Nonetheless, each and every time she called me over to watch some segment – usually art or science related – I did find it interesting and sometimes (gasp!) educational – even if I may have been hesitant in my childhood and adolescence to say so. It should go without saying that I watch Sunday Morning as often as possible, and usually have it teed-up on the DVR in case I miss it or want to re-watch something. I also watch The Daily Show with John Stewart on Comedy Central, and have watched it regularly ever since the show began with Craig Kilborn in 1996. There is one segment that occurs in every show, in fact it is the only recurring segment that remains to this day from the time the show began. That segment is “Your Moment of Zen.” The “Your Moment of Zen” segment started as a random clip of some funny or comedic thing happening, with no commentary. Over time this evolved into a clip of something related to a story or topic covered on the preceding show. Usually this includes something comedic, and/or being taken out of context, still with no commentary. The casual viewer of The Daily Show would probably never have connected this segment to anything in particular, just “one of those funny things The Daily Show does.” The keen observer, though, who also watches Sunday Morning, would know that every broadcast of that show ends with a segment that was never named or titled for much of the series’ history. This segment, now formally titled “Moment of Nature,” usually consists of a quiet, peaceful, or otherwise interesting nature scene – again, with no commentary. During the interview, Paul mentioned where the show came up with it’s well known “Your Moment of Zen” segment. It seems the writers liked the quiet vignettes at the end of [CBS News] Sunday Morning. Thus “Your Moment of Zen” is an homage to that close – a moment of video, pulled from the wires, without commentary and for simple consumption. So for anyone like me, who’s always wondered, there you have it! Where would we be without such journalistic masterpieces as Sunday Morning, and mom to teach us to appreciate them. More of you probably already watch The Daily Show than don’t, but I’d also venture a guess that more of you don’t watch Sunday Morning than do. You don’t know what you’re missing. Ironically, I read this while watching Sunday Morning! Love the comparison, and yes, I do still DVR the show each week. Glad to see you’ve been imprinted with this small bit of my DNA. After all, you’re the reason I started watching in the first place. Sunday Morning was “born” the month after you, and you had me up and awake during those early years! 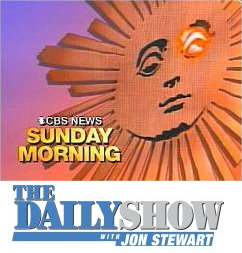 I have watched CBS Sunday Morning since it first aired. I love the nature scenes segment. It seems to me the segment has gotten shorter over the years (or maybe just my memory is shorter). When the show started it went for >240 seconds, recently it was <35 seconds. Is there data about the length of the nature segment over the years? I’m not aware of any data on the length of the segment, although I remember it being longer also. Advertising tends to take more time away from actual programming these days, and the segment itself (which was never sponsored in the past), now is. I’m sure that must have something to do with it.